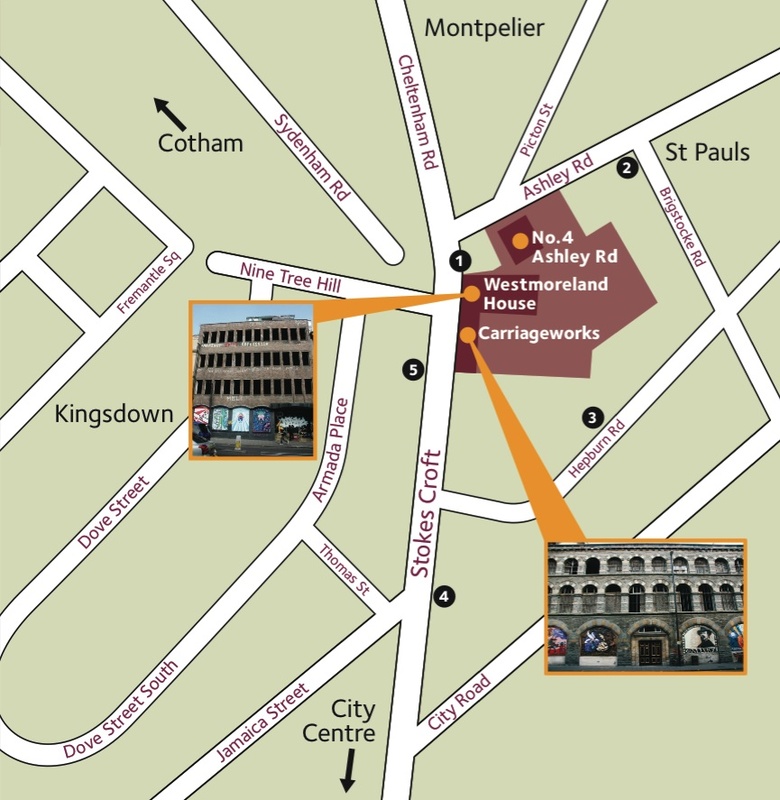 The Carriageworks, Westmoreland House and the surrounding land are owned by the Comer Homes Group, a London based property developer which bought the site in the 1980s. The Carriageworks was designed by EW Godwin, an important Victorian Architect. It is a Grade II* listed building in poor condition and is in English Heritage’s top ten buildings most “at risk” in the South West. The neighbouring Westmoreland House is a six storey 1960s concrete frame office building, last occupied in 1986 by the Football Pools. At the rear is 4 Ashley Road, a derelict but Grade II listed house, and a site currently occupied temporarily by a small group of people. The whole site measures 0.5 hectares (the same size as 1.6 football pitches). In 1989 planning permission was granted for a development of 63 flats, offices and underground parking but building works never started. In 2006 the Council and local communities agreed a policy for St Pauls (SPD10) that included guidelines for a variety of uses on the site including residential, business and leisure facilities. The owners submitted a new planning application for 153 flats, 5 shops and 112 parking spaces but in 2010 the Secretary of State refused permission at appeal. In 2011 a further planning application was submitted by the owners for the development of 183 flats, shops and underground parking on the site. During the writing of this Vision the application was being considered by the City Council.